I’ve never been a huge fan of cabbage and mostly it’s because I had not really tried it. I just looked gross, smelled gross and wasn’t something I was interested in trying. 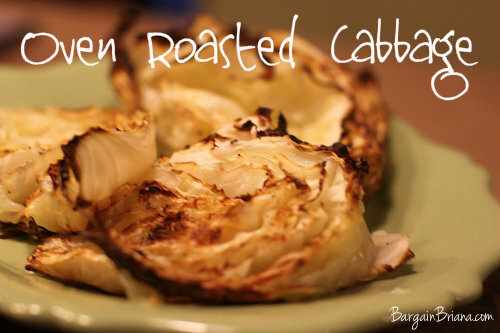 Then I saw a recipe for roasted cabbage on Pinterest (I didn’t pin it though so I’m not sure where it originated!) and decided I would try it when it was on sale a few weeks back. It’s super simple. Just toss with olive oil and sprinkle with your favorite seasonings such as salt, pepper, seasoned salt, etc! Cook at 400 degrees for 30 minutes or until crispy. It is better the longer you cook it. Cut into slices or wedges. Toss in olive oil or spray with your Misto. Cook at 400 degrees for 30 minutes or until browned and crispy!